We are a local, family owned locksmith located in the center of Palm Beach County. We have provided automotive, residential and commercial locksmith service for over 20 years. We quote a fair price and stick to it. We know that there are many locksmiths that offer cheap prices, but don’t get fooled by the scam. These people aren’t very good locksmiths and resort to tricks to earn their living. Often, the $20 quoted price can turn into hundreds, after they finish the job. We can help. We can either pick the lock of your home or business or use special tools to enter your car. 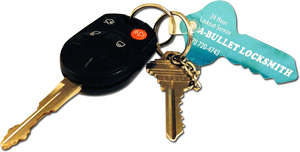 If you can’t find your keys, we can make new ones, even transponder and high security keys. Just call us, we’ll give you an estimate right over the phone. Do you need to change your locks right away? When you are protecting your family and your livelihood, trust only a true professional to offer fast, efficient locksmith service at reasonable prices. As an ALOA member, we have passed the international standard for professional certification in field of premises security. This means recognition of our outstanding skills, training, experience and leadership within the locksmith industry We accept most major credit cards, including Discover, American Express Mastercard and Visa.